Beautifully updated condo steps from America's #1 beach! 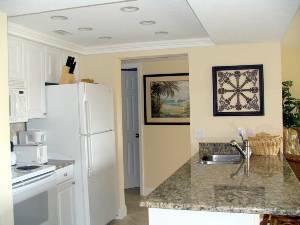 As the condo owner we offer our light and bright two bedroom, 1 and 1/2 bath condo just across the street from the white sands of sunny Siesta Key Beach. Just 20 minutes from Sarasota Airport and about an hour from Tampa International Airport. Our lovely third floor condominium has been completely remodeled and professionally decorated! It has granite counter tops, new tile flooring, Tommy Bahama furnishings and flat-screen HDTVs. 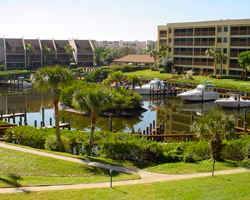 This beautiful condo has a spectacular view of the Intra-coastal Waterway from the living room, dining area, kitchen, and 18'Balcony. The tastefully decorated bedrooms can accommodate 4 guests. The Master includes a comfy King pillowtop bed. The guest room sleeps 2 in pillowtop twin beds. The kitchen is fully equiped for cooking if you wish. There is plenty of room on the balcony for dining or sipping morning coffee or evening cocktails all while enjoying the beautiful views of the pool, lushly landscaped grounds and lagoon. Provided in the unit at no extra charge is WiFi Internet as well as local and long distance calling (US only). The pool area offers full bathing facilities, tables, chairs, chaise lounges and umbrellas. There is also a community room available and changing/bathroom facilities. The beach is just a short stroll across the street using an automated crossing control. Have a boat? No problem. Docks are available right out the door for a nominal fee. tennis courts, basketball court, and a picnic area with BBQ grills. What more could you ask for? With all of this you will never want to leave! Computer connected to high speed cable internet,Wi-Fi in unit, Beach Towels,Beach toys, Fishing Gear. Sliding doors span the entire area offering access to the balcony and providing beautiful views of the pool and lagoon. Docking is available for your boat. Seating for 4 at the table, two at the breakfast counter. Granite and white cabinetry offers a light and bright area with everything you need for meal preparation. King size bed and flat screen TV. Cute and sunny Guest room with twin beds. Granite and tile in the Full Bath. "The view was wonderful, and our son truly enjoyed the heated pool." "We had a super time. This is our sixth trip in a row. We love this condo!!" "This place was wonderful to come back to after fun-filled days.The décor is wonderful; the big balcony is great!!" "Our first time in Siesta Key. The condo was beautifully furnished;we needed nothing!" "What a wonderful place!! The condo was perfect. Our family had a great stay." "Your condo turned out to be more spacious and cozy than we could have imagined. Thanks for sharing your individual style with us." "Thanks for your effort in creating such a nice place to stay." "We ate breakfast every morning on your spacious balcony and watched the boats come and go. It was absolutely breathtaking. We'll treasure the memories always." "Having access to the Internet was great. We were able to check our email and find out where the best restaurants and nightclubs were located." The condo and location were great for our family. The condo was very clean with plenty of fresh towels and bed linens. Thanks for a wonderful vacation. Deposit: $350.40 Deposit includes Damage Protection Plan to secure reservation, balance due 60 prior to arrival. Cancellations and Refunds: Cancellations before 60 days prior to arrival-refund of deposit minus $50. Cancellations within 60 days of arrival - no refund.